Overview: The UK’s best-selling hillwalking mag. Sling on a backpack & head for the hills! If you like to sling on a backpack, head for the hills and perform a little wild tenting, Trail Magazine is for you. Each factor is filled with: – Routes with complete OS mapping – Reviews of the most recent out of doors package – The UK’s splendid out of doors writing – Exclusive image and video content material As the United Kingdom’s greatest and best-selling hillwalking mag, we focus on probably the most stunning, maximum impressive and maximum difficult areas of Britain and Europe – and tell you about all of the equipment you want to discover them. If you wish to have journey you’ll be able to love Trail, and Trail will love you. If you like to sling on a backpack, head for the hills and perform a little wild tenting, Trail Magazine is for you. Each factor is filled with: – Routes with complete OS mapping – Reviews of the most recent out of doors package – The UK’s ideally suited out of doors writing – Exclusive image and video content material As the United Kingdom’s greatest and best-selling hillwalking mag, we focus on probably the most stunning, maximum impressive and maximum difficult areas of Britain and Europe – and let you know about the entire gear you wish to have to discover them. If you wish to have journey you’ll be able to love Trail, and Trail will love you. Overview: The images of soldiers and marines coming ashore on hostile shores are embedded in our collective memory of World War II. But what of the sailors who manned the landing craft, going back and forth under fire with nowhere to take cover, their craft the special targets of enemy gunners? In this book, Ken Wiley, a Coast Guardsman on an Attack Transport in the Pacific, relates the intricate, often nerve-wracking story of how the United States projected its power across 6,000 miles in the teeth of fanatical Japanese resistance. Each invasion was a swirl of moving parts, from frogmen to fire support, transport mother ships to Attack Transports, the smaller Higgins boats (LCVPs), and during the last terrifying stage the courageous men who would storm the beaches. The author participated in the campaigns for the Marshall Islands, the Marianas, the Philippines and Okinawa, and with a precise eye for detail relates numerous aspects of landing craft operations, such as ferrying wounded, that are often discounted. He conveys the terror and horrors of war, as well as, on occasion, the thrill, while not neglecting the humor and cameraderie of wartime life. An exciting book, full of harrowing combat action, D-Days in the Pacific also provides a valuable service in expanding our knowledge of exactly how World War II’s massive amphibious operations were undertaken. 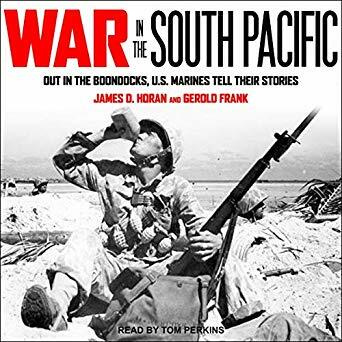 Overview: From Robert Leckie, the World War II veteran and New York Times bestselling author of Helmet for My Pillow, whose experiences were featured in the HBO miniseries The Pacific, comes this vivid narrative of the astonishing six-month campaign for Guadalcanal. From the Japanese soldiers’ carefully calculated-and ultimately foiled-attempt to build a series of impregnable island forts on the ground to the tireless efforts of the Americans who struggled against a tenacious adversary and the temperature and terrain of the island itself, Robert Leckie captures the loneliness, the agony, and the heat of twenty-four-hour-a-day fighting on Guadalcanal. Combatants from both sides are brought to life: General Archer Vandegrift, who first assembled an amphibious strike force; Isoroku Yamamoto, the naval general whose innovative strategy was tested; the island-born Allied scout Jacob Vouza, who survived hideous torture to uncover the enemy’s plans; and Saburo Sakai, the ace flier who shot down American planes with astonishing ease.